Gadzooks no!! for those of one’s devotees that think the dear Doctor has popped off the mortal coil, one can be assured that he is still alive and very much… eating. One’s absence is accounted for by an extended sojourn in Fort Lauderdale, Florida. One may offend one’s Floridian friends but dear readers with 4,000 odd eateries that exist there, it can be reported that it is sadly a gastronomic wasteland. This is evidenced by this Top 100 US restaurants list in a Forbes Magazine article which unsurprisingly contains many eateries in New York but absolutely none in Florida. One’s taste buds were so untitillated that one even hankers for the low grade offering at McSpigget’s. One had to downgrade one’s exemplary standards to those eateries that have some merit, recognising that casual dining proliferates in this relaxed and congenial part of the world. Here is one’s list, based on one’s experience of those establishments that are worth visiting ….and those that are not. One has even had to admit that one paid the odd visit to a Pizza restaurant. The best pizza restaurants are listed in a separate section below. One will endeavour to update this list as one plans to return and explore further. A separate wish list of Fort Lauderdale and Florida restaurants is already under way but if any of one’s American chums would like to suggest an eatery, your doctor would be delighted to try them out. Fortunately, one’s chums treated one to some respite from the mediocrity by inviting one to Boulud in Palm Beach which was high class and excellent. Particularly one’s excellent Negroni. Greek Islands – possibly the most popular restaurant in Fort Lauderdale. Bookings not taken. Join the queue and eat Greek salad and without a doubt the lamb chops are sublime. Do not be put off by the stewed look of the vegetables. This is your doctor’s number one eatery in Fort Lauderdale. 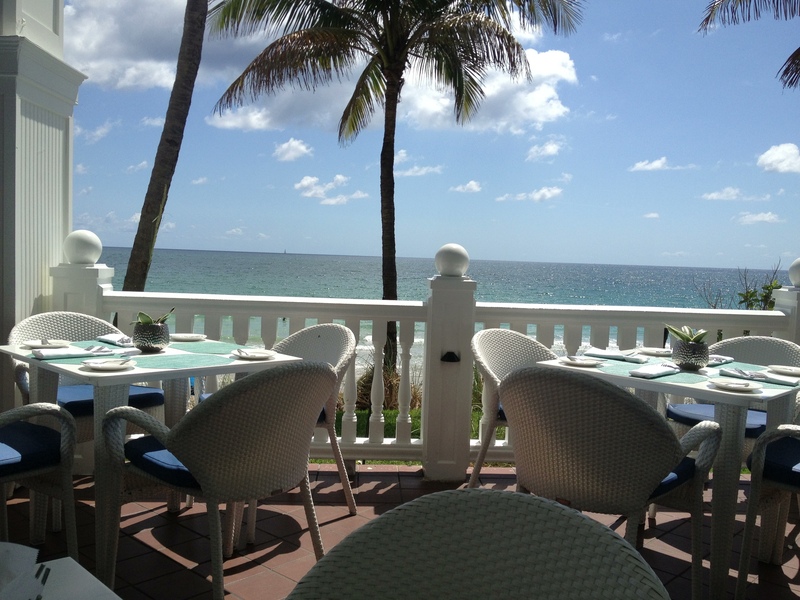 The Secret Garden – Pillars Hotel – the most classy and only restaurant in Fort Lauderdale that can truly be called elegant. One eats on the dock under the stars (at dinner of course dear readers!). Trulucks – Fresh Seafood with sensible portions for America. Unless one opts for a steak. Outrageously sized desserts for sharing. Capital Grille – A steak restaurant. It may be a chain but your dear doctor was impressed by this formula when he first visited the original in Washington D.C many years ago. Superb steaks. Seasons 52 – Excellent healthy option eatery with interesting small dessert options. Recommended. J. Alexanders – Standard American steak house. Large portions, good steaks and of course…burgers. Eduardo San Angel – Mexican but with pretentions. Not your standard offerings, Cilantro soup and crispy duck are very tasty. Worth visiting. Thasos – A newer, trendy and very attractive Greek restaurant to rival Greek Islands (see above). The food is good but can be expensive. Excellent moussaka. Ceviche – Peruvian, good quality, stylish restaurant with many styles of ceviche dishes. Fish to those that are ignorant of this style of cooking. Worth a visit. Blue Moon Fish Co. – wonderful location by the intracoastal. One’s obvious choice for al fresco lunch with 2 for 1 offers. Excellent Bloody Mary’s but dear readers dinner was a disaster. Casablanca – located in the very touristy beach area but the menu is interesting, varied and the food is of an acceptable bistro like quality. J. Marks – Another standard American steak house, not as good as J. Alexanders. Bonefish – Standard American style restaurant that specialises in fish. Do NOT go here early unless one likes eating in a crèche! beware the flying “soothers”. Chart House – yes dear readers, a chain restaurant but one must admit the location by the intracoastal has merits and the food is of good quality. Rosies – an effervescent lunchtime crowd who eat al fresco. One of the largest choices on the menu that one has ever seen. One took a whole lunch time to read it. Not food of the highest standard at all so do not come here for a gastronomic experience. Wraps, salads etc. Thai Spice – Thai restaurant liked by many locals and if you crave Thai then it is the only choice. Enormous portions. Not your Doctor’s choice as it lacks finesse. Galanga – Thai restaurant with modern overtones. Eat here if desperate for Asian food. Anthony’s Coal Fired Pizza – no bookings but unbelievably popular. Busier than McSpigget’s on a Friday night. Fort Lauderdale Pizza – sassy, more mature ladies serve with a smile and a joke. Very reasonable prices and one leaves having had some entertainment. Big Louie‘s Pizza – Renowned as being best for Pizza but one prefers the others listed. On the odd occasion that Dr Lunch should be home, I wonder what he eats or perhaps he is incapable of cooking for himself!! The Doctor should join me at Dabbous to take his mind off the underwhelming fare of the Colonies. The scallop tartare with eucalyptus will purge any remaining bad memories. My dear Sir Cosmo. Name the date!